Working construction and yoga don’t usually go together, but in the case of Yogi Troy McPeak, that’s precisely how one led to the other. Wanting a life that was more healthy and fulfilling, Yogi Troy decided to take a chance and walk off the beaten path in order to find something that he knew his life had been missing: purpose. With our most zen program Model Yoga now in its third season, Yogi Troy is taking time from his own Peak Beings yoga studio and is sharing his many years of hard to bring flexibility, confidence and harmony to our lovely models and audiences worldwide once again! Read the full and exclusive interview with Yogi Troy down below! What led you down the path to changing your career and becoming a dedicated yoga instructor? I guess it was a little over 10 years ago now that yoga really showed up and started to change my life. I had dabbled in it years before, but wasn’t conscious enough to really tap into it’s power. I was working as a construction manager and engineer on large construction projects and was working over 70 hours a week and totally stressed out. My personal life was also dissolving around me and basically everything that I had known to be my normal life had turned into a chaotic mess. Magically, at this same time, a friend invited me to a yoga class and after a few weeks of struggling through the postures I started to really feel the changes in my body and wasn’t sure how it was changing me mentally and emotionally, but I knew that after every class I felt better. I quit my job about 3 months later knowing that if I continued along the path I was on I would not make it very far nor would it be a fulfilling life. I started doing more and more yoga and with a goal to travel the world, I set off on a travel adventure that led me to my first yoga teacher training. That one month changed my life forever and when I graduated, I knew that life would never be the same and that my focus would be to try to help people through yoga the way that it helped me. It hasn’t been all smooth sailing, but there is nothing I would rather be doing and to have a career where I am helping people every day is one of the most fulfilling things to me. Can you expound upon your impressive journey of yoga training? What was it like? After quitting my job, I spent about 3 years training in many different styles of yoga. It had become my life, and the discipline of yoga, teaching others and my own self discovery were my main focus. The first training I took opened my eyes up to all that yoga had to offer and it was things beyond asana, like meditation, breathing, relaxation and ways to tap into all of the layers of myself. It was all very empowering! My engineering and construction management career had provided me with financial stability, but it had not fulfilled me the way that teaching yoga had, and I felt like I had finally realized my purpose in life. How did you come to be the instructor of Model Yoga? I am so honored to be the instructor for Model Yoga again. I helped to create the original Season 1 format and themes and it is so great to be back for Season 3. With a clear vision of what I want to create this season, I want to bring my teachings to the people out there practicing yoga for the first time or the thousandth time. Season 3 was a great opportunity to build upon what was created in past seasons by connecting with people on a physical level, but additionally connecting with them on a energetic and emotional level where they can bring their yoga practice on the mat out into their everyday life. Peak Beings Yoga has quite an international following. When did that develop and how did it evolve into what it is today? I started Peak Beings Yoga in 2008 with some week long Tai Chi and Meditation Training. From there, I started offering international yoga retreats and was traveling the world teaching adults and children wherever I was visiting. My passion and goal were always to direct Yoga Teacher Trainings, so everything I was doing was preparing me teaching them. I started putting on international yoga teacher trainings in 2012, and since then have directed 17 Yoga Teacher Training sessions around the world. Outside of Model Yoga, do you work with other models, actors or celebrities? I travel so much that I haven’t been in one place to be able to make myself available for individual or public classes. However, I have had several models attend my trainings to help them gain flexibility, balance and strength while also gaining confidence, clarity and spiritual connection. What kinds of students usually attend your classes at Peak Being? The students that have attended my Yoga Teacher Training have ranged in age from 17 to 67, so it is a wide range of ages. People come from all over the world for a variety of reasons. Not everyone comes to teach yoga. Many people come just to deepen their practice and gain an awareness of their physical body, emotions and thoughts, while others’ focus is mainly on learning to teach yoga so they can spread their love of the practice and help others the same way it helped them. It is always amazing to watch a group of people from such different backgrounds and cultures connect and become like a family and truly support each other throughout their journey of the training and beyond. The thing I like most about teaching yoga is connecting with people in a safe space and helping them to gain awareness of themselves. Initially, I have to be there and guide them, but my main goal is to gradually help them develop a practice of their own so that they are able to stand on their own two feet and really be with themselves and create a more happy and fulfilling life. How do you like to spend your free time when you get the chance to relax? I love to be out in nature. Living and traveling in many cities, I try to enjoy simple moments and like to pause to listen to the birds, ocean and wind and just appreciate stillness and the calm and wise energy of nature. I love biking everywhere I go to use my body and respect the environment, stay connected and travel at a pace that works for me. It’s also a nice way to avoid the traffic. Haha! I also love trail running and swimming. Besides getting in shape, what other benefits are there to practicing yoga? There are so many other benefits to yoga than the physical. Most yoga practitioners these days start with asana or postures as it is the easiest thing to connect with. The body is always in the present moment and therefore it is a great tool to keep the practitioner’s mind focused which overall helps them to slow down. In this process of slowing down is where the awareness of body is started. From there the learning of awareness is then naturally transmitted out into their life and they begin to live a more mindful and conscious life, which is where they start to realize where they are spending their energy, who they are spending time with and how they can direct their time and energy in the future to help them take steps toward the life they want to live. Catch Yogi Troy on Model Yoga Season 3 every Saturday morning at 8:00 (UTC+8). For more information about Model Yoga, please visit http://fashionone.com/modelyoga. 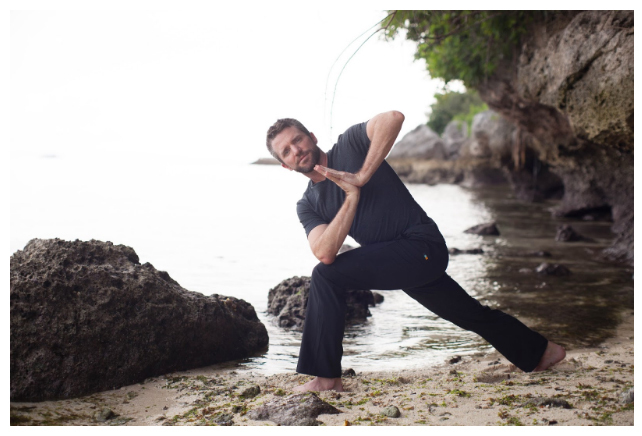 Learn more about how you can further your yoga training with Yogi Troy at his very own studio, Peak Beings, by visiting http://www.peakbeings.com.